chicken hearts, spleens and liver mixed with bits of lamb, onion. Jerusalem mixed grill (Hebrew: מעורב ירושלמי‎‎) (me'orav Yerushalmi) is a grilled meat dish considered a specialty of Jerusalem, Israel. 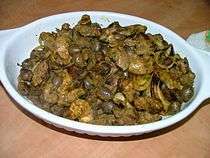 It consists of chicken hearts, spleens and liver mixed with bits of lamb cooked on a flat grill, seasoned with onion, garlic, black pepper, cumin, turmeric, olive oil and coriander. The dish is said to have been invented at the Mahane Yehuda Market, with various steakhouses claiming to be the originators. In 2009, Israeli chefs created a giant portion that weighed in at 440 pounds (200 kilos), winning a Guinness world record for the largest Jerusalem mixed grill. They also prepared the world's smallest dish: Jerusalem mixed grill in a pita the size of a coin. According to Haaretz food critic Daniel Rogov, world-renowned chefs have pleaded with Sima, one of the steakhouses, for the recipe, which includes a secret ingredient described as "Georgian pepper." 1 2 Daniel Rogov (2007-03-22). "Dining Out / Mixed Jerusalem grill in Tel Aviv". Haaretz. Retrieved 2013-03-20. ↑ "Largest 'Jerusalem mixed grill'-Israeli chefs sets world record". World Record Academy. 2009-12-02. Retrieved 2013-03-20.